Buy, sell, and apply installment on precious metals. 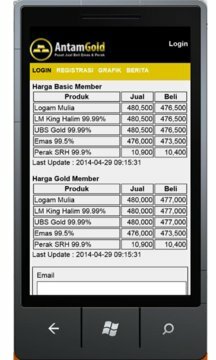 Using AntamGold.com mobile app, you can have a private pool account for gold and silver. PT. Sinar Rezeki Handal provides pool account service for precious metals, latest and daily price for gold and silver, buy and sell certified precious metal from PT. Antam Tbk. Let's start saving from 0.001 gram.